To say that the Quebec International Pee-Wee Hockey Tournament is unrivaled anywhere would be a vast understatement. It seems that everyone who has ever attended the event – now in its 57th year – raves about it, some going so far as to call it a life-changing experience. Surely, the recently concluded tournament will be one that will be long remembered for the four California teams that attended – the Anaheim Jr. Ducks, the San Jose Jr. Sharks and two teams from the Los Angeles Jr. Kings program. 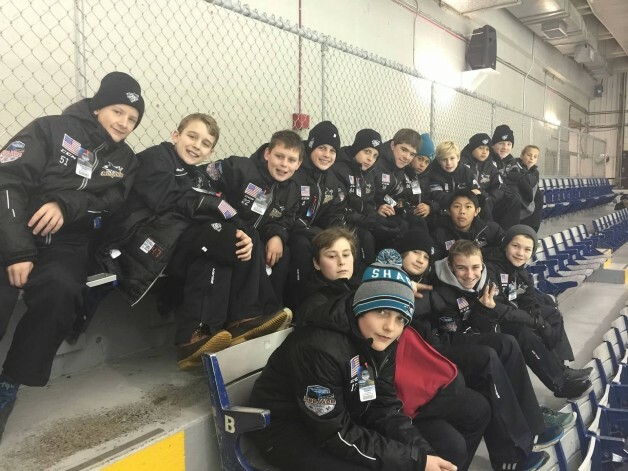 With approximately 150 teams converging on Quebec City from all over the world, the level of hockey is always top notch, but the tournament is even more appealing for the players’ experiences off the ice. From billeting with local families to playing pond hockey, visiting the local sites and spending 10 days in a new and different city and climate, no other tournament really compares. Adams’ Jr. Sharks roster includes forwards Max Abene, Nick Cantor, Antonio Fernandez, Zach Louvelle, Dylan Smith, Wes Turner, Alex Ustinov, Rylan Yates and Daniel Yusupoff; defensemen Jack Laser, Reese Laubach, Sean McDonald, Andrew Ralston, Leo Sobotka and Joe Sweeney; and goalies Cody Naporano and Da An Nguyen-Vo. The Jr. Ducks team that went to Quebec is coached by Jean Labbe. The roster included forwards Luke Ellis, Naveen Gupta, Joshua Hyden, Anthony Jurcic, Joshua Lee, Rowen Lin, Benjamin Palmersheim, Samir Panwar and Hayden Rand; defensemen Xander Kane, Tyler Lee, Logan Okanski, Brandon Plaga and Ross Roloson; and goalies Lucas Massie and Sandrine Ponnath. Labbe, who grew up in Montreal, played in the Quebec tournament more than a quarter century ago, and returned to the event as a coach for the first time this year. He said it stirred some fond memories. Jeff Turcotte coaches the Jr. Kings’ Pee Wee Major team. His roster includes forwards Noah Alvarez, Brody Biller, Jordan Brisson, Andre Gasseau, Arvega Hovsepyan, Paul Minnehan, Parker Murray, Riley Ruh and Ean Somoza; defensemen Shai Buium, Ryan Gumlia, Aidan Hreschuk, Shane McElhaney, Ty Murchison and Spencer Shugrue; and goalies Alexander Bonrouhi and Jackson Baker. Turcotte grew up playing for Detroit Compuware and went with teams to the Quebec tournament three times. As a coach, he has taken teams there six different seasons, but that doesn’t make the experience any less special each time. The Jr. Kings Pee Wee AA1 team is coached by Daniel Kim and includes forwards Nathan Fix, Dexter Isbell, Akseli Kangaslahti, Elliott Korzen, Quincy Scallion, Blake Simons, Alexander Tatoian, Jesse Troyer and Vladimir Yushenko; defensemen Max Baker, Sebastien Brockman, William Cole Chisholm, Tobin Fix, Taylor Hirsch and Carter Lee; and goalies Jeffrey Dreger and Philip O’Neill.